Asian bush honeysuckle dominates a forest edge, competing for light, water, and nutrients. Removal of mature shrubs is labor-intensive but releases native plants along the woodline. This photo shows how much space was occupied by bush honeysuckle. A typical amount of brush removed on a work day. The identification of invasive plants is the first step to invasive plant management. Understanding how that species lives and reproduces is the next step. Knowing the timing of a plant’s life cycle can greatly affect the outcome of any treatment strategy. Alien Species: With respect to a particular ecosystem, any species, its seeds, eggs, spores, or any biological material capable of propagating that species that is not native to the ecosystem. Invasive Species: An alien species whose introduction does or is likely to cause economic or environmental harm, or harm to human health. 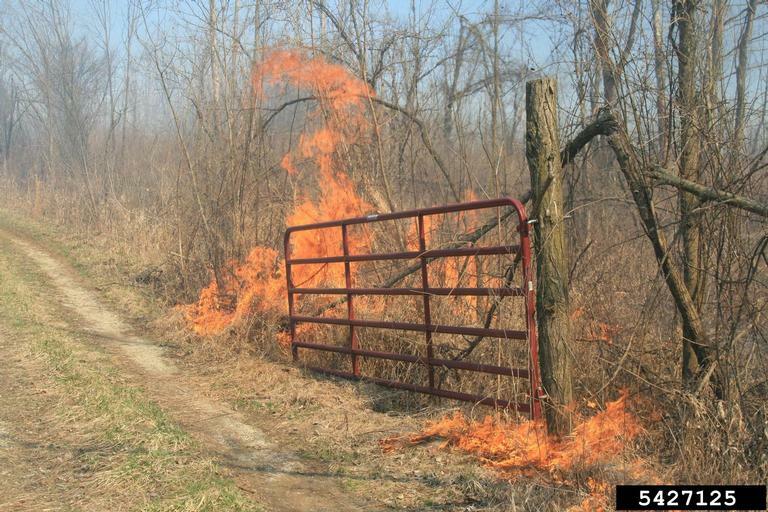 Extensive Japanese stiltgrass litter can intensify fire behavior in eastern forests. Not all non-native plants become invasive in uncultivated areas, or anywhere else. Not all ornamental plants become invasive. Some native plants can spread aggressively in cultivated or wild areas. However, a significant proportion of invasive plants were introduced through selective breeding and sale as garden ornamentals. What gives? Plants have been moved around the globe and selectively bred for centuries to meet a demand for new species, fashionable varieties, and pest- or disease-free specimen plants. Commercially successful ornamentals are selected to be adaptable to many environments, unpalatable to herbivores (especially insects), free of disease, abundantly flowering, with showy fruit for additional interest, and easy to establish and grow. With all those traits bred into the species, it’s a wonder that more of them have not jumped the garden fence. The species which become established and spread across new continents – not all of which were bred for horticulture, of course – are frequently invasive around the world. And there are native North American plants invading Europe and Asia. It’s a small world, after all. There are methods for ranking how invasive a species has become within a given region. There are also risk assessments to predict which species are likely to become invasive if introduced to a new continent. The Ohio Invasive Plants Council recently adopted a set of ranking criteria for the state. Many other states use similar methods. The assessment uses a combination of published information about species biology and known range, and current data about the distribution and spread of species within the state of Ohio. A challenge for applying ranking assessments is the incomplete or inconsistent collection of invasive plant data. Another challenge to addressing plant invasions is a lack of regulation or consistent policies to assess risk before importation and sale of new species. Gardeners and landscape professionals are tuning in to the value and uses of native plants in cultivated landscapes. The benefits to pollinators, wildlife, and soil are reason enough to incorporate more natives into home gardens and commercial landscapes. The astonishing array of beautiful color and texture at every layer in the landscape is another incentive to broaden our plant choices. But as with all good things…buyer beware. Buying native plants is not as easy as it looks, and there are differences of opinion within the horticultural industry about native plants. Each of the topics below has sparked lively discussions in the field and online, and each merits a posting of its own. Who decides what’s native? – Doug Tallamy does an excellent job of sorting through the important aspect of this questions in his books, focusing on the role that a species plays in the ecosystem. Sometimes the best way to think about this question is to find out whether the plants are providing more resources (food, shelter) than they are taking (light, water, nutrients) from their environment. “Native to where?” – Species ranges have always shifted with climate changes. It is probable that species from climatic zones further south will continue to expand into our region. We need new ways to evaluate or define how plants fit according to our historical perspective. Local vs. nonlocal genotypes. Where conservation of genetic diversity is concerned (for example on nature preserves), the source of the plant material matters. Wild-harvested or nursery-grown? The ethics of plant conservation discourages the collection of plants from the wild. Plant rescues in the face of imminent development are an exception. Collecting plant material on public lands is not allowed without a permit. Are cultivars of native species okay? It depends who you ask. Plants serve multiple functions, including the provision of nectar, pollen, fruit, and seeds. When these characteristics are bred out of a plant species, these ecological values are lost. The same logic applies to long-lived species like street trees which are all genetic clones. If thousands of planted trees and shrubs have identical genes, then they are (in theory) identically vulnerable to new pests or diseases.